khazen.org, "Our joy has no limit!." Glory to our New Patriarch!!! The Glory of Lebanon is given to you - All of the khazen will serve as your servants Patriarch Mar Bechara Al Raai. 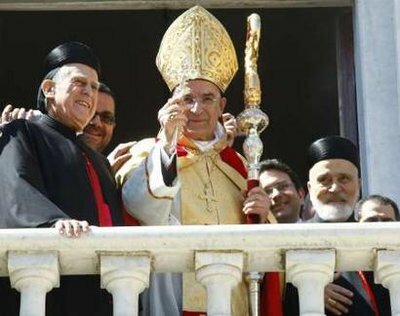 The khazen family pray for the new Patriarch to continue, in strengthening and lead he Maronite Catholic Nation all around the World. It is a day of extreme hope, unity and happiness for Khazen.org! Rai, 71, who was the Archbishop of Jbeil, is the 77th patriarch of the Maronite Church, a position. Rai was elected after almost a week of deliberations by 38 bishops at the Maronite Patriarchate in Bkirki. 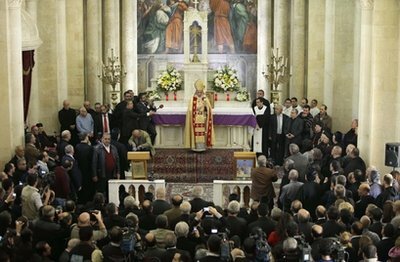 His election was celebrated by a televised mass while Maronite churches across the country rang bells at midday in celebration. “The elections took place with love and peace,” Rai said in a televised speech. Monsignor Youssef Tawk, head of the Council of Maronite bishops, announced the news from the church's headquarters in Bkerke, northeast of Beirut, after days of meetings behind closed doors during which the Bishops voted on who would succeed the long-serving Sfeir. Well-wishers, including politicians and clergymen, immediately began to pour in to Bkerke upon hearing the news, some shedding tears of joy. Cardinal Patriarch Boutros Nasrallah is very happy of the election of the Patriarch and has said of Raii "He is one of the pillars of the church (in Lebanon) and is open to all the communities, he added. "He is a very qualified person from a spiritual standpoint, he listens to everyone and greets everyone the same, whatever their background." "The El Khazen family represented by two members (Ghosta Branch and Ajaltoun Branch) will have the honor to guard Bkerke during the next election of the Maronite Patriarch. This is a special power and preeminence that Bkerke has over the El Khazen family, as a consequence of its sovereignty and safety of election. The main duty is to ensure that there will be no interference or influence from any outsiders. Cheikh Farid Haikal El Khazen will represent the Ghosta branch and Cheikh Amine Keserouan El Khazen will represent the Ajaltoun Branch. His beatitude Patriach Sfeir has accomplished tremendously for Lebanese, ensured freedom, Maronite safety and growth throughout the last three decades. 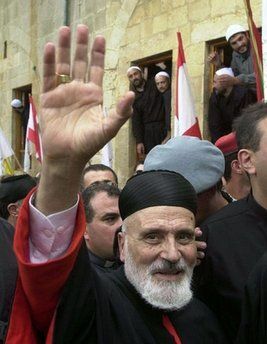 The El khazen as a whole are very thankful about the great and unique accomplishments of His Beatitude Patriarch Sfeir and they will remain always servants of the Patrarch at his service." 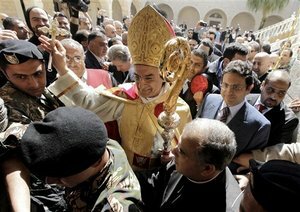 BEIRUT: Newly elected Maronite Patriarch Beshara Rai was born in the Metn town of Hemlaya on Feb. 25, 1940. Before his election Tuesday, Rai was head of the Maronite Diocese of the coastal town of Jbeil, northern Beirut, from 1990. Rai received his intermediate and high school education at the College Notre-Dame de Jamhour. In 1962, he received a bachelor’s degree in philosophy and theology and in 1975 he received a PhD in canon and civil law. Rai also studied three years of law at the Pontifical Lateran University in Rome. In 1995, Rai was appointed by Pope John Paul II as a member in the Pontifical Council for the Pastoral Care of Migrants and Itinerants and he has served on the council since then. In 2005, he was appointed by the Council of the Catholic Patriarchs of the Orient as a coordinator for the Episcopal Commission for the Family in the Middle East in 2005. More recently in 2010, Rai was appointed by Pope Benedict XVI as a member of the Pontifical Council for Social Communications. The new patriarch has also worked in academia. He has been a lecturer in pontifical theology and the sacrament of matrimony at Universite Saint-Esprit De Kaslik since 2001. He has also been a lecturer in legal rights at Sagesse University in Beirut since 2001. The first electoral rounds will begin Friday morning or afternoon after a secretary general – to preside over electoral rounds – and a committee to sort out votes is elected Thursday by the Synod of Bishops following hours of prayers. Former Kesrouan MP Farid Haykal El Khazen and former ambassador Amin El Khazen locked the patriarchate’s doors to visitors. By tradition, members of the Khazen family stand guard in Bkirki until a patriarch is elected. The tradition began in 1703 when a member of the Khazen family used to guard the monastery, which was then under construction, before it became the seat of the patriarchate in 1823. Thirty-seven Maronite bishops, among them several presiding over dioceses across the world, arrived in Bkirki by Wednesday afternoon after flying to Lebanon. khazen.org The El Khazen family also would like to send its eloge, gratitude to His Excellency Mgr. Roland ABOU JAOUDE General Patriarchal Vicar Auxiliary Maronite Patriarcal Protosyncelle. Who has played a unifying role for all of the Maronites Nation, in bringing all leaders together and has offered tremendeously to the Maronite Church and to the Lebanese overall. It is through his leadership, unique actions and faith that we are stronger today. 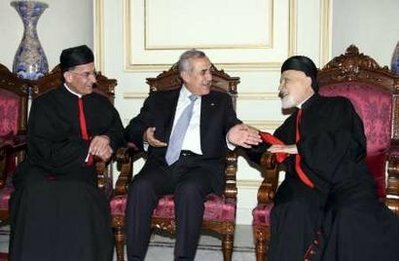 Catholic news agency: "Pope Benedict XVI has formally accepted the resignation of Maronite Catholic Patriarch Nasrallah Pierre Sfeir, who is retiring at the age of 91.Cardinal Sfeir has led the Maronite Church since 1986. A new Patriarch of Antioch will be elected at a meeting of the Maronite Synod of Bishops, expected to be held at Bkirke, the headquarters of the patriarchate, in March. At his request, Patriarch Rai will officially be installed on the feast of the Annunciation, March 25. Catholic patriarchs do not have their elections confirmed by the pope, but the new patriarch will request and receive spiritual communion from Pope Benedict XVI. The 77th patriarch of the Maronite Catholic Church said "Communion and Charity" would be his motto. You began your noble ministry of patriarch of the Maronites amidst the torment of the war which bloodied the face of Lebanon for so many years. With the ardent desire for peace in your country, you led the Church and travelled the world to console those obliged to emigrate. Finally, peace returned, ever fragile but still extant. The outgoing Patriarch will convene the Maronite Synod to elect his successor—according to reports in Lebanon, in the middle of March. He denied that he had his own favored candidates, stressing that the younger Maronite bishops would make the decision. by Richard Van Leewen - Notables and Clergy in Mount Lebanon "The political prestige of the El Khazen Sheiks, and even their position as Consuls of France, was partly founded on the endorsement of the Maronite prelates and the European missionaries. In the course of the 17th century, when the Khazens asserted their control over Kiserwan, the symbiosis between secular and clerical authority took the form of an all-embracing secular patronage over the church and the dominance of lay interests. It should be noted that this lay interference was not inconsistent with tradition, as no clear definition of the role of laymen in the church existed. The privileges acquired by the Khazens were not seen as an infringement of traditional practice or of clerical independence as it was justified by their secular authority and, moreover, provided the clergy with obvious advantages. En 1704, le patriarcat maronite se trouvait au Liban-Nord, car ce fut la que les maronites se refugierent. La region etait surtout metouali et son zaim Issa Hamade demanda au patriarche Douaihy une importante somme d'argent. Devant refus de celui-ci d'obtemperer, Hamade le gifla et se repandit en injures. Sur ce, le patriarche ecrivit a cheikh Hosn El-Khazen et ce dernier ramena de Deir-Qannoubine, son lieu de residence, au Kesrouan ou il logea durant trois mois au couvent Mar Challita de Ghosta. En 1750, les Khazen avaient offert Bkerke et cetafaisait plusieurs decennies que les Khazen priaient en vain le patriarcat de se transferer du Nord vers le Kesrouan ou se trouvait la plus grande partie de ses ouailles. Ce n'est que quand ce fut un Kesrouanais, en I'occurrence Youssef Hobeiche, appartenant a une grande famille, parent des Khazen, qui parvint a la tete du patriarcat de 1823 jusqu'en 1845, que le siege d'hiver fut transfere a Bkerke tout en gardant Dimane comme residence estivale. De tous les privileges inherents aux Khazen, il en reste un, hereditaire : celui permet a deux Cheikhs de la famille, de la branche de Ajaltoun et I'autre celle de Ghosta de garder les portes conclave des eveques reunis pour I'election d'un nouveau patriarche. Before the doors were locked, the bishops, headed by Sfeir, gathered in the patriarchate’s church to voice prayers with the participation of the Vatican’s ambassador, Gabriel Caccia. As doors were closed, all Bkirki’s telecommunications were shut down, including landline phones and Internet access. Special equipment to jam cellular phone signal within the patriarchate perimeter was also deployed. The spiritual conclave, which could take up to 15 days, requires a quorum of two-thirds of the attending bishops for a new patriarch to be elected. If the bishops fail to elect a patriarch after 15 days, it is left to the Vatican to appoint one. A maximum of 60 rounds of elections will take place with four rounds daily: two in the morning and two in the afternoon. When asked about the circumstances governing the electoral process, the bishops were unanimous in calling for the Holy Spirit to inspire them to elect the best candidate. 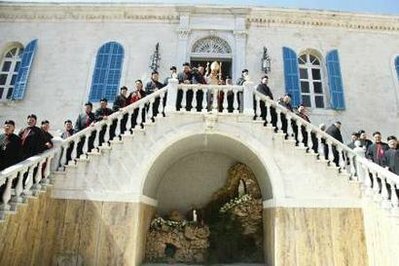 BKIRKI: Well-wishers flocked to the seat of the Maronite Patriarchate in Bkirki Tuesday as soon as Jbeil Bishop Beshara Rai was announced Lebanon’s 77th Maronite Patriarch. 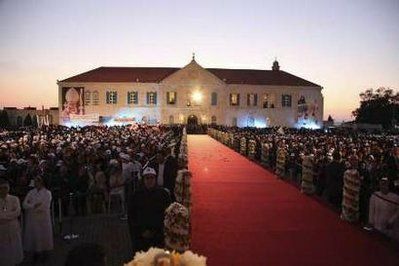 Shortly after the announcement, politicians, well-wishers and believers poured to the seat of the Maronite Patriarchate in Bkiriki, northeast of Beirut, to congratulate the new patriarch and celebrate his nomination. “It’s a great day, I’m very happy, I can’t describe it,” said an obviously moved Joe Marwan, a 20-year-old student on his way to the Patriarchate. Monsignor Youssef Tawk, head of the Council of Maronite Bishops, announced around noon that Bishop Rai of the Diocese of Jbeil had been named as the new Patriarch of Antioch and all the East for the Maronites, Lebanon’s most influential church. Rai succeeds Patriarch Nasrallah Butros Sfeir, who resigned last month. The parking lot in front of the headquarters was jam-packed, and some had already stuck pictures of the new patriarch on their windshields. “This is the perfect patriarch, he’s the best one ever,” said Simon Yasimi, 37, owner of a restaurant. Tuesday also witnessed a breach to the Maronite Patriarchate’s long-standing protocol, with Bkirki keeping its doors open all day long without interruption, including during lunch. Thirty-nine Bishops had deliberated for six days in total isolation from the outside world in the Kesrouan town of Bkirki to elect the church’s new patriarch, after Sfeir decided to end his tenure following 25 years in service. “I think he might be the best one in such times,” said Hoda Beshara, a 55-year-old teacher. “A lot of people are saying he isn’t moderate enough but he’s the one who deserves the job the most,” she added. Inside the Bkirki courtyard, Maronite worshippers were congratulating each other and praising Rai. “We are greatly blessed by the Lord, [who gave us] such a young, open-minded and cultured patriarch, devoted to the church,” said Leila Tannouri, a woman in her 50s who described herself as “very pious,” adding that she goes to church every day. Rai, who is 71, is a well-known public figure in Lebanon, who served at the head of the country’s Catholic Media Council. “We are very, very happy today,” said Iyam Rayes, 46, as she distributed pastries and baklava to those gathered in the courtyard. “The Holy Spirit worked with the bishops for Monsignor Rai to become patriarch,” said a monk who refused to give his name. Maha Othman, a Muslim, said it was important for her to come congratulate the new patriarch. “I came here to congratulate the Maronites and the patriarch. I wish him all success,” said the lawyer from the north Lebanon province of Minnieh. In Rai’s hometown of Hemlaya, in the Metn region, the announcement provoked an explosion of joy. Hemlaya’s residents and those of surrounding areas gathered to celebrate in the town’s main square, near the Maronite church. Church bells tolled and fireworks were set off. The meeting of the synod of Maronite Bishops, who have been convening in isolation from the outside world since Wednesday, has been shrouded in secrecy in an indication of a close race among favorite candidates, the source said. When Sfeir was elected in 1986 to succeed late Patriarch Antoine Khreich, he, like his precedent, was elected as a compromise candidate after then favorites failed to guarantee a two-thirds majority. The new patriarch Mar Bechara al Raii was elected on Tuesday March 15. Rai was elected by a conclave of Bishops after six days of consultations to find a successor to 90-year-old Cardinal Nasrallah Sfeir, who resigned last month to allow a younger bishop to take his place. Sfeir served as patriarch for 25 years and became a strong critic of Syria’s military presence in Lebanon, calling on Damascus to pull troops out in 2000, after Israel withdrew from southern Lebanon. Syrian forces eventually withdrew in 2005. “We pray for Lebanon especially to get out of its (political) crisis,” Rai said after his election at the Maronite centre of Bkirke, overlooking Lebanon’s port of Jounieh. “We carry Lebanon in our prayers to regain its role in these difficult days that the east is living in,” he added, referring to turbulence in the Arab world where popular uprisings have overthrown two autocrats, triggered fierce fighting in Libya and challenged entrenched governments across the region. Maronite churches across Lebanon rang bells at midday to mark Rai’s election. BEIRUT -- Church bells rang, horns blasted and firecrackers echoed throughout Lebanon as it was announced that Bishop Bechara Rai of Jbeil, Lebanon, had been elected the new patriarch of the Maronite Catholic Church. 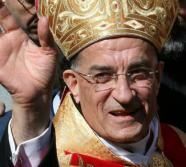 Patriarch Rai, 71, known for his courage to speak the truth, is seen as someone who can unite Maronite Catholics, who have been divided among political party lines. The patriarch's election was announced March 15. Elections began March 11, after the Maronite synod spent two days in spiritual retreat and reflection. He replaces Cardinal Nasrallah P. Sfeir, 90, who retired because of age. Father Joseph Mouawad, vicar general of Jbeil, predicted Patriarch Rai would unite Maronite Catholics and begin a pastoral renewal of the church. "I think his first mission will be to confirm us in our faith here in Lebanon and, as head of the church, he will try to unite Christians, the different parties, and to consolidate the communion among the Maronites," Father Mouawad said. "He has a deep spirituality, and he is very sociable and open to the others, and he has great courage. He says the truth even if someone doesn't want to listen to it," Father Mouawad said. "I think on a national level in Lebanon, he will work to conserve this country to be a country of conviviality of all religions -- between Christian and Muslims," the priest added. Of Lebanon's population of nearly four million, approximately 33 percent are Christian. Of the approximately 5.5 million Maronite Catholics worldwide, approximately 1 million live in Lebanon. 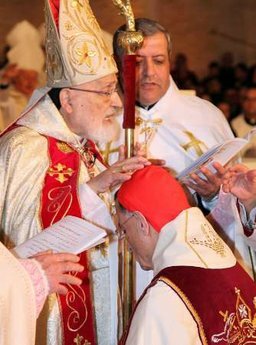 Syrian Catholic Patriarch Ignatius Youssef III Younan called the new patriarch "a good friend, an outstanding leader and well-gifted bishop." "His intense spirituality, solid formation and openness of heart will be, God willing, a tremendous asset to reunite all Catholic Maronites in Lebanon, in the Middle Eastern countries and in the church," said Patriarch Younan. Maronite Father Joseph Mouannes, secretary of the communications commission for Catholic bishops of the Middle East, called the election "really the choice of the Holy Spirit. And a great choice." "He has done a lot for dialogue between Muslims and Christians. He was always the voice of truth, the voice of dignity, of freedom and respect," Father Mouannes said. The new patriarch has served as president of the Lebanese bishops' communications committee and hosted a weekly program on Telelumiere, Lebanon's Christian television station. The program, "Boushra al Rahi," which means "Good News of the Shepherd," provided commentary and teaching on that Sunday's Gospel, and the patriarch encouraged listeners to live the Scriptures in a practical way. Maronite Father Camille Mubarak, dean of the faculty of political science at Beirut's Sagesse University, said Patriarch Rai "can resolve many problems, politically and socially." He predicted the patriarch would "try to make peace between Christians first (the political parties), and then he will try to make peace among all the people of Lebanon." The priest added, "We know when we go to his office, we can see a simple man, a kind man who can talk with anybody with great attention." "He's a good teacher and a good diplomat," Father Mubarak said. Mohammad Sammak, secretary-general of Lebanon's Christian-Muslim Committee for Dialogue, said Patriarch Rai has an ability to transcend divisions. "I think he can play a very constructive role for the future of Christians in the Middle East," Sammak said. Patriarch Rai "is known for being very courageous in expressing his point of view, and actually he speaks out what he believes in. That's why it is easy to deal with him, because he's honest with himself," he added. He was born Feb. 25, 1940, in Himlaya, Lebanon. He was ordained a priest of the Maronite Order of the Blessed Virgin Mary Sept. 3, 1967, and was made a Bishop in 1986. He has served as bishop of Jbeil since 1990. Ø¨Ø´Ø§Ø±Ø© ÙŠÙˆØ³Ù Ø§Ù„Ø±Ø§Ø¹ÙŠ Ø§Ø¨Ù† Ø«Ù…ÙŠÙ†Ù‡ Ø§Ù„Ø±Ø§Ø¹ÙŠ Ù…ÙƒØ§Ù† ÙˆØªØ§Ø±ÙŠØ® Ø§Ù„ÙˆÙ„Ø§Ø¯Ø© : Ø­Ù…Ù„Ø§ÙŠØ§ - Ø§Ù„Ù…ØªÙ† (Ù„Ø¨Ù†Ø§Ù†) ÙÙŠ 25 Ø´Ø¨Ø§Ø· 1940 Ø§Ù„Ù†Ø°ÙˆØ± Ø§Ù„Ø§Ø­ØªÙØ§Ù„ÙŠØ© : ÙÙŠ Ø§Ù„Ø±Ù‡Ø¨Ø§Ù†ÙŠØ© Ø§Ù„Ù…Ø§Ø±ÙˆÙ†ÙŠØ© Ø§Ù„Ù…Ø±ÙŠÙ…ÙŠØ© Ø¨ØªØ§Ø±ÙŠØ® 31 ØªÙ…ÙˆØ² 1962 Ø§Ù„Ø±Ø³Ø§Ù…Ø© Ø§Ù„ÙƒÙ‡Ù†ÙˆØªÙŠØ© : 3 Ø£ÙŠÙ„ÙˆÙ„ 1967 Ø§Ù„Ø±Ø³Ø§Ù…Ø© Ø§Ù„Ø§Ø³Ù‚ÙÙŠØ© : Ø³ÙŠÙ…ÙŽ Ù†Ø§Ø¦Ø¨Ø§Ù‹ Ø¨Ø·Ø±ÙŠØ±ÙƒÙŠØ§Ù‹ Ø¹Ø§Ù…Ø§Ù‹ ÙÙŠ Ø¨ÙƒØ±ÙƒÙŠ Ø¨ØªØ§Ø±ÙŠØ® 12 ØªÙ…ÙˆØ² 1986 Ø§Ù„Ø¯Ø±ÙˆØ³ 1957-1962 : Ø§Ù„Ø¯Ø±ÙˆØ³ Ø§Ù„ØªÙƒÙ…ÙŠÙ„ÙŠØ© ÙˆØ§Ù„Ø«Ø§Ù†ÙˆÙŠØ© ÙÙŠ ÙƒÙ„ÙŠØ© Ø³ÙŠØ¯Ø© Ø§Ù„Ø¬Ù…Ù‡ÙˆØ± Ù„Ù„Ø¢Ø¨Ø§Ø¡ Ø§Ù„ÙŠØ³ÙˆØ¹ÙŠÙŠÙ†. 1962-1975 : ÙÙ„Ø³ÙØ© ÙˆÙ„Ø§Ù‡ÙˆØª (Ù„ÙŠØ³Ø§Ù†Ø³) ÙˆØ­Ù‚ÙˆÙ‚ ÙƒÙ†Ø³ÙŠØ© ÙˆÙ…Ø¯Ù†ÙŠØ© (Ø¯ÙƒØªÙˆØ±Ø§Ù‡) ÙˆÙ…Ø­Ø§Ù…Ø§Ø© Ø±ÙˆØªØ§Ù„ÙŠØ© (3 Ø³Ù†ÙˆØ§Øª) ÙÙŠ Ø±ÙˆÙ…Ø§ (Ø¬Ø§Ù…Ø¹Ø© Ù…Ø§Ø± ÙŠÙˆØ­Ù†Ø§ Ø§Ù„Ù„Ø§ØªØ±Ø§Ù† - Ù…Ø­ÙƒÙ…Ø© Ø§Ù„Ø±ÙˆØªØ§ Ø§Ù„Ø±ÙˆÙ…Ø§Ù†ÙŠØ©). Ø§Ù„Ù†Ø´Ø§Ø·Ø§Øª ÙˆØ§Ù„Ù…Ù‡Ø§Ù… ÙÙŠ Ø§Ù„Ø±Ù‡Ø¨Ø§Ù†ÙŠØ© Ø§Ù„Ù…Ø§Ø±ÙˆÙ†ÙŠØ© Ø§Ù„Ù…Ø±ÙŠÙ…ÙŠØ© 1975-1981 : Ø´ØºÙ„ Ù…Ù†ØµØ¨ Ø±Ø¦ÙŠØ³ Ù…Ø¯Ø±Ø³Ø© Ø³ÙŠØ¯Ø© Ø§Ù„Ù„ÙˆÙŠØ²Ù‡ 1978-1984 : Ø£Ø³Ù‘Ø³ ÙˆØªÙˆÙ„Ù‘Ù‰ Ø¥Ø¯Ø§Ø±Ø© "Ù…Ø±ÙƒØ² Ø§Ù„Ù„ÙˆØ²Ø© Ù„Ù„ØªØ¹Ù„ÙŠÙ… Ø§Ù„Ø¹Ø§Ù„ÙŠ" - Ø¬Ø§Ù…Ø¹Ø© Ø³ÙŠØ¯Ø© Ø§Ù„Ù„ÙˆÙŠØ²Ù‡. 1975-1984 : Ø®Ø§Ø¯Ù… Ù„Ø±Ø¹Ø§ÙŠØ§ Ø²ÙˆÙ‚ Ù…ØµØ¨Ø­ (Ø§Ù„Ø¨Ù„Ø¯Ø©ØŒ Ù†Ù‡Ø± Ø§Ù„ÙƒÙ„Ø¨ - Ø§Ù„Ù…Ø³ÙŠØ­ Ø§Ù„Ù…Ù„ÙƒØŒ Ø£Ø¯ÙˆÙ†ÙŠØ³). 1977-1982 : Ù‚Ø§Ø¶ ÙÙŠ Ø§Ù„Ù…Ø­ÙƒÙ…Ø© Ø§Ù„Ø§Ø¨ØªØ¯Ø§Ø¦ÙŠØ© Ø§Ù„Ù…Ø§Ø±ÙˆÙ†ÙŠØ© Ø§Ù„Ù…ÙˆØ­Ø¯Ø©. 1982-1986 : Ø±Ø¦ÙŠØ³ Ø§Ù„Ù…Ø­ÙƒÙ…Ø© Ø§Ù„Ø¨Ø·Ø±ÙŠØ±ÙƒÙŠØ© Ø§Ù„Ø§Ø³ØªØ¦Ù†Ø§ÙÙŠØ©. 1984-1986 : Ø±Ø¦ÙŠØ³ Ù…Ø¯Ø±Ø³Ø© Ø§Ù„Ù‚Ø¯ÙŠØ³Ø© Ø±ÙŠØªØ§ Ø¶Ø¨ÙŠÙ‡ ÙˆÙƒØ§Ù‡Ù† Ø±Ø¹ÙŠØªÙŠ Ø§Ù„ØµØ¹ÙˆØ¯ ÙˆÙ…Ø§Ø± Ø¬Ø±Ø¬Ø³ - Ø§Ù„Ø¶Ø¨ÙŠÙ‘Ù‡. Ø§Ù„Ù†Ø´Ø§Ø·Ø§Øª ÙˆØ§Ù„Ù…Ù‡Ø§Ù… ÙÙŠ Ø§Ù„Ø­ÙŠØ§Ø© Ø§Ù„Ø§Ø³Ù‚ÙÙŠØ© 1986 - 1990 : Ù†Ø§Ø¦Ø¨ Ø¨Ø·Ø±ÙŠØ±ÙƒÙŠ Ø¹Ø§Ù… ÙÙŠ Ø¨ÙƒØ±ÙƒÙŠ 1990 : Ù…Ø·Ø±Ø§Ù† Ø£Ø¨Ø±Ø´ÙŠØ© Ø¬Ø¨ÙŠÙ„ Ù…Ù†Ø° Ø³Ù†Ø© 1990ØŒ Ø¨Ø¹Ø¯ ÙØµÙ„Ù‡Ø§ Ø¹Ù† Ø§Ù„Ø£Ø¨Ø±Ø´ÙŠØ© Ø§Ù„Ø¨Ø·Ø±ÙŠØ±ÙƒÙŠØ© ÙˆØ¬Ø¹Ù„Ù‡Ø§ Ø£Ø¨Ø±Ø´ÙŠØ© Ù‚Ø§Ø¦Ù…Ø© Ø¨Ø°Ø§ØªÙ‡Ø§. 1986 - 1992 : Ù…Ø´Ø±Ù Ø¹Ù„Ù‰ Ø§Ù„Ù…Ø­Ø§ÙƒÙ… Ø§Ù„Ø±ÙˆØ­ÙŠØ© Ø§Ù„Ù…Ø§Ø±ÙˆÙ†ÙŠØ©. 1986 - 1991 : Ù…Ø´Ø±Ù Ø¹Ù„Ù‰ Ø±Ø§Ø¨Ø·Ø© ÙƒØ§Ø±ÙŠØªØ§Ø³ Ù„Ø¨Ù†Ø§Ù†. 1992 - 1995 : Ø¹ÙŠÙ†Ù‡ Ø§Ù„Ø¨Ø§Ø¨Ø§ ÙŠÙˆØ­Ù†Ø§ Ø¨ÙˆÙ„Ø³ Ø§Ù„Ø«Ø§Ù†ÙŠ Ù…Ù†Ø³Ù‘Ù‚Ù‹Ø§ Ù„Ø³ÙŠÙ†ÙˆØ¯Ø³ Ø§Ù„Ø§Ø³Ø§Ù‚ÙØ© Ø§Ù„Ø±ÙˆÙ…Ø§Ù†ÙŠ Ø§Ù„Ø®Ø§Øµ Ø¨Ù„Ø¨Ù†Ø§Ù†. 1988 - 2000 : Ø¹ÙŠÙ†Ù‡ Ø§Ù„ÙƒØ±Ø³ÙŠ Ø§Ù„Ø±Ø³ÙˆÙ„ÙŠ Ø±Ø¦ÙŠØ³Ù‹Ø§ Ù„Ù„Ø¬Ù†Ø© ØªÙ†Ø³ÙŠÙ‚ Ø§Ù„Ù†Ø´Ø§Ø·Ø§Øª Ø§Ù„Ø§Ø¬ØªÙ…Ø§Ø¹ÙŠØ© ÙˆØ§Ù„Ø±Ø§Ø¹ÙˆÙŠØ© ÙˆØ§Ù„Ø§Ù†Ù…Ø§Ø¦ÙŠØ© ÙÙŠ ÙƒÙ†ÙŠØ³Ø© Ù„Ø¨Ù†Ø§Ù†. 1988 - 1994 : Ø¹ÙŠÙ†Ù‡ Ø§Ù„Ø¨Ø§Ø¨Ø§ ÙŠÙˆØ­Ù†Ø§ Ø¨ÙˆÙ„Ø³ Ø§Ù„Ø«Ø§Ù†ÙŠ Ø¹Ø¶ÙˆÙ‹Ø§ ÙÙŠ Ø§Ù„Ù…Ø¬Ù„Ø³ Ø§Ù„Ø¨Ø§Ø¨ÙˆÙŠ " Ù‚Ù„Ø¨ ÙˆØ§Ø­Ø¯" Ù…Ù†Ø° 1992 : Ù…Ù†ØªØ®Ø¨ Ù…Ù† Ù‚Ø¨Ù„ Ø³ÙŠÙ†ÙˆØ¯Ø³ Ø£Ø³Ø§Ù‚ÙØ© Ø§Ù„ÙƒÙ†ÙŠØ³Ø© Ø§Ù„Ù…Ø§Ø±ÙˆÙ†ÙŠØ© Ù„Ø¹Ø¶ÙˆÙŠØ© Ø§Ù„Ù„Ø¬Ù†Ø© Ø§Ù„Ù‚Ø§Ù†ÙˆÙ†ÙŠØ© ÙˆÙ…Ø­ÙƒÙ…Ø© Ø§Ù„Ø³ÙŠÙ†ÙˆØ¯Ø³. Ù…Ù†Ø° 1995 : Ø¹ÙŠÙ†Ù‡ Ø§Ù„Ø¨Ø§Ø¨Ø§ ÙŠÙˆØ­Ù†Ø§ Ø¨ÙˆÙ„Ø³ Ø§Ù„Ø«Ø§Ù†ÙŠ Ø¹Ø¶ÙˆÙ‹Ø§ ÙÙŠ Ø§Ù„Ù…Ø¬Ù„Ø³ Ø§Ù„Ø¨Ø§Ø¨ÙˆÙŠ Ù„Ø±Ø§Ø¹ÙˆÙŠØ© Ø§Ù„Ù…Ù‡Ø§Ø¬Ø±ÙŠÙ† ÙˆØ§Ù„Ù…Ù‡Ø¬Ø±ÙŠÙ† ÙˆØ§Ù„Ø³ÙˆØ§Ø­ ÙˆØ§Ù„Ù„Ø§Ø¬Ø¦ÙŠÙ†. Ù…Ù†Ø° 1997 : Ù…Ù†ØªØ®Ø¨ Ù…Ù† Ù‚Ø¨Ù„ Ø¬Ù…Ø¹ÙŠØ© Ø§Ù„Ø¨Ø·Ø§Ø±ÙƒØ© ÙˆØ§Ù„Ø§Ø³Ø§Ù‚ÙØ© ÙÙŠ Ù„Ø¨Ù†Ø§Ù† (APECL ) Ø±Ø¦ÙŠØ³Ø§Ù‹ Ù„Ù„Ø¬Ù†Ø© Ø§Ù„Ø§Ø³Ù‚ÙÙŠØ© Ù„Ø´Ø¤ÙˆÙ† Ø§Ù„Ø¹Ø§Ø¦Ù„Ø© ÙÙŠ Ù„Ø¨Ù†Ø§Ù†. 1998-2003 : Ø¹Ø¶Ùˆ ÙÙŠ Ø§Ù„Ù„Ø¬Ù†Ø© Ø§Ù„Ø¨Ø·Ø±ÙŠØ±ÙƒÙŠØ© Ù„ØªØ·Ø¨ÙŠÙ‚ Ø§Ù„Ø§Ø±Ø´Ø§Ø¯ Ø§Ù„Ø±Ø³ÙˆÙ„ÙŠ "Ø±Ø¬Ø§Ø¡ Ø¬Ø¯ÙŠØ¯ Ù„Ù„Ø¨Ù†Ø§Ù†" (Ù„Ø®Ù…Ø³ Ø³Ù†ÙˆØ§Øª). Ù…Ù†Ø° 1998 : Ù…Ù†ØªØ®Ø¨ Ù…Ù† Ù‚Ø¨Ù„ Ø³ÙŠÙ†ÙˆØ¯Ø³ Ø§Ø³Ø§Ù‚ÙØ© Ø§Ù„ÙƒÙ†ÙŠØ³Ø© Ø§Ù„Ù…Ø§Ø±ÙˆÙ†ÙŠØ© Ø¹Ø¶ÙˆØ§Ù‹ ÙÙŠ Ø§Ù„Ø³ÙŠÙ†ÙˆØ¯Ø³ Ø§Ù„Ø¯Ø§Ø¦Ù…. Ù…Ù†Ø° 1999 : Ø¹ÙŠÙ‘Ù†Ù‡ Ø§Ù„Ø¨Ø§Ø¨Ø§ ÙŠÙˆØ­Ù†Ø§ Ø¨ÙˆÙ„Ø³ Ø§Ù„Ø«Ø§Ù†ÙŠ Ø¹Ø¶ÙˆØ§Ù‹ ÙÙŠ Ù…Ø¬Ù„Ø³ Ø±Ø¦Ø§Ø³Ø© Ø§Ù„Ù…Ø¬Ù„ÙŠ Ø§Ù„Ø­Ø¨Ø±ÙŠ Ù„Ù„Ø¹Ø§Ø¦Ù„Ø©. 1999 - 2001 : Ø¹ÙŠÙ‘Ù†Ù‡ Ø§Ù„ÙƒØ§Ø±Ø¯ÙŠÙ†Ø§Ù„ Ø³ÙŠÙ„ÙØ³ØªØ±ÙŠÙ†ÙŠ Ø±Ø¦ÙŠØ³ Ù…Ø¬Ù…Ø¹ Ø§Ù„ÙƒÙ†Ø§Ø¦Ø³ Ø§Ù„Ø´Ø±Ù‚ÙŠØ©ØŒ Ø¹Ø¶ÙˆØ§Ù‹ ÙÙŠ Ø§Ù„Ù„Ø¬Ù†Ø© Ø§Ù„Ø¹Ù„Ù…ÙŠØ© Ù„Ù„Ù…Ø¤ØªÙ…Ø± Ø§Ù„Ø¯ÙˆÙ„ÙŠ Ø­ÙˆÙ„ Ù…Ø¬Ù…ÙˆØ¹Ø© Ù‚ÙˆØ§Ù†ÙŠÙ† Ø§Ù„ÙƒÙ†Ø§Ø¦Ø³ Ø§Ù„Ø´Ø±Ù‚ÙŠØ© (19-23 ØªØ´Ø±ÙŠÙ† Ø§Ù„Ø«Ø§Ù†ÙŠ 2001). Ù…Ù†Ø° 2000 : Ø¹ÙŠÙ†Ù‡ Ø§Ù„ÙƒØ§Ø±Ø¯ÙŠÙ†Ø§Ù„ Ø§Ù„Ø¨Ø·Ø±ÙŠØ±Ùƒ Ù…Ø§Ø± Ù†ØµØ±Ø§Ù„Ù„Ù‘Ù‡ Ø¨Ø·Ø±Ø³ ØµÙÙŠØ± Ù…Ù…Ø«Ù„Ø§Ù‹ Ù„Ù„ÙƒÙ†ÙŠØ³Ø© Ø§Ù„Ù…Ø§Ø±ÙˆÙ†ÙŠØ© ÙÙŠ Ø§Ù„Ù„Ø¬Ù†Ø© Ø§Ù„Ø£Ø³Ù‚ÙÙŠØ© Ù„Ø®Ø¯Ù…Ø© Ø§Ù„Ù…Ø­Ø¨Ø©. 2000 - 2006 : Ø§Ù†ØªØ®Ø¨Ù‡ Ø§Ù„Ø³ÙŠÙ†ÙˆØ¯Ø³ Ø§Ù„Ù…Ø§Ø±ÙˆÙ†ÙŠ Ø¹Ø¶ÙˆØ§Ù‹ ÙÙŠ Ù„Ø¬Ù†Ø© Ø§Ù„ØªÙ†Ø³ÙŠÙ‚ ÙˆØ§Ù„ØªØ®Ø·ÙŠØ· Ø¨ÙŠÙ† Ø§Ù„Ø³Ù„Ø·Ø© Ø§Ù„ÙƒÙ†Ø³ÙŠØ© ÙˆØ§Ù„Ø±Ù‡Ø¨Ø§Ù†ÙŠØ§Øª Ø§Ù„Ù…Ø§Ø±ÙˆÙ†ÙŠØ©. Ù…Ù†Ø° 2003 : Ù…Ù†ØªØ®Ø¨ Ù…Ù† Ø³ÙŠÙ†ÙˆØ¯Ø³ Ø§Ø³Ø§Ù‚ÙØ© Ø§Ù„ÙƒÙ†ÙŠØ³Ø© Ø§Ù„Ù…Ø§Ø±ÙˆÙ†ÙŠØ© Ø§Ù…ÙŠÙ† Ø§Ù„Ø³Ø± Ù„Ù„Ø³ÙŠÙ†ÙˆØ¯Ø³. Ù…Ù†Ø° 2004 : Ù…Ù†ØªØ®Ø¨ Ù…Ù† Ø³ÙŠÙ†ÙˆØ¯Ø³ Ø§Ù„ÙƒÙ†ÙŠØ³Ø© Ø§Ù„Ù…Ø§Ø±ÙˆÙ†ÙŠØ© Ù…Ø´Ø±ÙØ§Ù‹ Ø¹Ù„Ù‰ ØªÙˆØ²ÙŠØ¹ Ø§Ù„Ø¹Ø¯Ø§Ù„Ø© ÙÙŠ Ù…Ø­Ø§ÙƒÙ… Ø§Ù„ÙƒÙ†ÙŠØ³Ø© Ø§Ù„Ù…Ø§Ø±ÙˆÙ†ÙŠØ© ÙˆØ±Ø¦ÙŠØ³ Ù…Ø­ÙƒÙ…Ø© Ø§Ù„Ø³ÙŠÙ†ÙˆØ¯Ø³ ÙÙŠ Ø§Ù„Ø¯Ø¹Ø§ÙˆÙ‰ Ø§Ù„Ù‚Ø¶Ø§Ø¦ÙŠØ© Ù„Ù„Ø§Ø³Ø§Ù‚ÙØ© ÙˆØ§Ù„Ø§Ø¨Ø±Ø´ÙŠØ§Øª. Ù…Ù†Ø° 2005 : Ø¹ÙŠÙ‘Ù†Ù‡ Ù…Ø¬Ù„Ø³ Ø¨Ø·Ø§Ø±ÙƒØ© Ø§Ù„Ø´Ø±Ù‚ Ø§Ù„ÙƒØ§Ø«ÙˆÙ„ÙŠÙƒ Ù…Ù†Ø³Ù‘Ù‚Ù‹Ø§ Ù„Ù„Ø¬Ø§Ù† Ø§Ù„Ø£Ø³Ù‚ÙÙŠØ© Ù„Ù„Ø¹Ø§Ø¦Ù„Ø© ÙÙŠ Ø¨Ù„Ø¯Ø§Ù† Ø§Ù„Ø´Ø±Ù‚ Ø§Ù„Ø£ÙˆØ³Ø·. 2009 : Ù…Ù†ØªØ®Ø¨ Ù…Ù† Ù‚Ø¨Ù„ Ø¬Ù…Ø¹ÙŠØ© Ø§Ù„Ø¨Ø·Ø§Ø±ÙƒØ© ÙˆØ§Ù„Ø§Ø³Ø§Ù‚ÙØ© ÙÙŠ Ù„Ø¨Ù†Ø§Ù† (APECL) Ø±Ø¦ÙŠØ³Ø§Ù‹ Ù„Ù„Ø¬Ù†Ø© Ø§Ù„Ø§Ø³Ù‚ÙÙŠØ© Ù„Ù„Ø§Ø¹Ù„Ø§Ù… Ø§Ù„ÙƒØ§Ø«ÙˆÙ„ÙŠÙƒÙŠ ÙÙŠ Ù„Ø¨Ù†Ø§Ù†. 2010 : Ø¹ÙŠÙ‘Ù†Ù‡ Ø§Ù„Ø¨Ø§Ø¨Ø§ Ø¨Ù†Ø¯ÙƒØªØ³ Ø§Ù„Ø³Ø§Ø¯Ø³ Ø¹Ø´Ø± Ø¹Ø¶ÙˆÙ‹Ø§ ÙÙŠ Ø§Ù„Ù…Ø¬Ù„Ø³ Ø§Ù„Ø­Ø¨Ø±ÙŠ Ù„ÙˆØ³Ø§Ø¦Ù„ Ø§Ù„Ø§ØªØµØ§Ù„Ø§Øª Ø§Ù„Ø§Ø¬ØªÙ…Ø§Ø¹ÙŠØ©. ØªØ¹Ù„ÙŠÙ… 1978-1987 : Ø§Ø³ØªØ§Ø° Ù…Ø­Ø§Ø¶Ø± ÙÙŠ Ù…Ø§Ø¯Ø© Ø§Ù„Ø­Ù‚ Ø§Ù„Ù‚Ø§Ù†ÙˆÙ†ÙŠ ÙÙŠ Ø¬Ø§Ù…Ø¹Ø© Ø§Ù„Ù‚Ø¯ÙŠØ³ ÙŠÙˆØ³Ù (Ø¨ÙŠØ±ÙˆØª). 1992-2000 : Ø§Ø³ØªØ§Ø° Ù…Ø­Ø§Ø¶Ø± ÙÙŠ Ù…Ø§Ø¯Ø© Ø§Ù„Ø­Ù‚ Ø§Ù„Ù‚Ø§Ù†ÙˆÙ†ÙŠ ÙÙŠ ÙƒÙ„ÙŠØ© Ø§Ù„Ø­Ù‚ÙˆÙ‚ (Ø§Ù„ÙƒØ³Ù„ÙŠÙƒ). Ù…Ù†Ø° Ø¹Ø§Ù… 2001 : Ø§Ø³ØªØ§Ø° Ù…Ø­Ø§Ø¶Ø± ÙÙŠ Ø§Ù„Ù„Ø§Ù‡ÙˆØª Ø§Ù„Ø±Ø§Ø¹ÙˆÙŠ ÙˆØ³Ø±Ù‘ Ø§Ù„Ø²ÙˆØ§Ø¬ ÙÙŠ ÙƒÙ„ÙŠØ© Ø§Ù„Ù„Ø§Ù‡ÙˆØª Ø§Ù„Ø­Ø¨Ø±ÙŠØ© (Ø§Ù„ÙƒØ³Ù„ÙŠÙƒ). Ù…Ù†Ø° Ø¹Ø§Ù… 2001 : Ø§Ø³ØªØ§Ø° Ù…Ø­Ø§Ø¶Ø± ÙÙŠ Ù…Ø§Ø¯Ø© Ø§Ù„Ø­Ù‚ Ø§Ù„Ù‚Ø§Ù†ÙˆÙ†ÙŠ ÙÙŠ Ø¬Ø§Ù…Ø¹Ø© Ø§Ù„Ø­ÙƒÙ…Ø© Ø¨ÙŠØ±ÙˆØª. Ø§Ù„Ø±Ø³Ø§Ø¦Ù„ Ø§Ù„Ø±Ø§Ø¹ÙˆÙŠØ© "Ø£Ù†Ø§ Ù…Ø¹ÙƒÙ… ÙƒØ§Ù‡Ù† ÙˆÙ„Ø£Ø¬Ù„ÙƒÙ… Ø£Ø³Ù‚Ù"ØŒ Ø¥Ø­ØªÙØ§Ù„ ØªÙˆÙ„ÙŠØ© Ø§Ù„Ù…Ø·Ø±Ø§Ù† Ø¨Ø´Ø§Ø±Ù‡ Ø§Ù„Ø±Ø§Ø¹ÙŠ Ø¹Ù„Ù‰ Ø£Ø¨Ø±Ø´ÙŠØ© Ø¬Ø¨ÙŠÙ„ØŒ Ø§Ù„Ø£Ø­Ø¯ 8 ØªÙ…ÙˆØ² 1990. "Ø£Ø¬Ù‡Ø²Ø© Ø§Ù„Ø£Ø¨Ø±Ø´ÙŠØ© Ø§Ù„Ø§Ø¯Ø§Ø±ÙŠØ© ÙˆØ§Ù„Ø§Ø¬ØªÙ…Ø§Ø¹Ø§Øª ÙˆØ§Ù„Ø±Ø¹ÙˆÙŠØ©"ØŒ Ø³Ù„Ø³Ù„Ø© Ø­Ø¶Ø§Ø±Ø© Ø§Ù„Ù…Ø­Ø¨Ø©ØŒ Ø¹Ø¯Ø¯1ØŒ 1990. "Ù…Ø¯Ø®Ù„ Ø¥Ù„Ù‰ Ø¥Ø¹Ø¯Ø§Ø¯ Ø§Ù„Ø¬Ù…Ø¹ÙŠØ© Ø§Ù„Ø®Ø§ØµØ© Ù„Ø³ÙŠÙ†ÙˆØ¯Ø³ Ø§Ù„Ø£Ø³Ø§Ù‚ÙØ© Ù…Ù† Ø£Ø¬Ù„ Ù„Ø¨Ù†Ø§Ù†"ØŒ Ø³Ù„Ø³Ù„Ø© Ø­Ø¶Ø§Ø±Ø© Ø§Ù„Ù…Ø­Ø¨Ø©ØŒ Ø¹Ø¯Ø¯3ØŒ 1991. "ØªØ¬Ø¯Ù‘Ø¯ ÙˆØ´Ù‡Ø§Ø¯Ø©ØŒ Ø¹Ù„Ù‰ Ù‡Ø¯Ù‰ Ø§Ù„Ù…Ø¬Ù…Ø¹ Ø§Ù„Ø±Ø§Ø¹ÙˆÙŠ Ù…Ù† Ø£Ø¬Ù„ Ù„Ø¨Ù†Ø§Ù†"ØŒ Ø³Ù„Ø³Ù„Ø© Ø­Ø¶Ø§Ø±Ø© Ø§Ù„Ù…Ø­Ø¨Ø©ØŒ Ø¹Ø¯Ø¯4ØŒ 1992. "Ø£ÙˆÙ‚Ø§Ù Ø§Ù„Ø±Ø¹Ø§ÙŠØ§ ÙÙŠ Ø£Ø¨Ø±Ø´ÙŠØ© Ø¬Ø¨ÙŠÙ„ØŒ Ø§Ù„ÙˆÙ‚Ù ÙˆØºØ§ÙŠØ§ØªÙ‡ - Ø§Ù„Ù†Ø¸Ø§Ù… Ø§Ù„Ø¯Ø§Ø®Ù„ÙŠ - Ø¯ÙˆØ± Ø§Ù„Ø¹Ù„Ù…Ø§Ù†ÙŠÙŠÙ†"ØŒ Ø³Ù„Ø³Ù„Ø© Ø­Ø¶Ø§Ø±Ø© Ø§Ù„Ù…Ø­Ø¨Ø©ØŒ Ø¹Ø¯Ø¯5ØŒ 1994. "Ø±Ø¬Ø§Ø¡ ÙˆØªØ¬Ø¯Ø¯ ÙˆØ´Ù‡Ø§Ø¯Ø©ØŒ Ø¯Ø®ÙˆÙ„ ÙÙŠ Ù…Ø³ÙŠØ±Ø© Ø³ÙŠÙ†ÙˆØ¯Ø³ Ø§Ù„Ø£Ø³Ø§Ù‚ÙØ© Ù…Ù† Ø£Ø¬Ù„ Ù„Ø¨Ù†Ø§Ù†"ØŒ Ø³Ù„Ø³Ù„Ø© Ø­Ø¶Ø§Ø±Ø© Ø§Ù„Ù…Ø­Ø¨Ø©ØŒ Ø¹Ø¯Ø¯6ØŒ 1995. "ØªØ·Ø¨ÙŠÙ‚ Ø§Ù„Ø´Ø±Ø¹ Ø§Ù„Ø®Ø§Øµ Ø¨Ø§Ù„ÙƒÙ†ÙŠØ³Ø© Ø§Ù„Ù…Ø§Ø±ÙˆÙ†ÙŠØ© ÙÙŠ Ø£Ø¨Ø±Ø´ÙŠØ© Ø¬Ø¨ÙŠÙ„"ØŒ Ø³Ù„Ø³Ù„Ø© Ø­Ø¶Ø§Ø±Ø© Ø§Ù„Ù…Ø­Ø¨Ø©ØŒ Ø¹Ø¯Ø¯7ØŒ 1996. "Ù…ÙˆØ§Ø¶ÙŠØ¹ Ù„ØªØ­Ø¶ÙŠØ± Ø§Ù„Ø²ÙˆØ§Ø¬ ÙÙŠ Ø£Ø¨Ø±Ø´ÙŠØ© Ø¬Ø¨ÙŠÙ„ Ø§Ù„Ù…Ø§Ø±ÙˆÙ†ÙŠØ©"ØŒ Ø³Ù„Ø³Ù„Ø© Ø­Ø¶Ø§Ø±Ø© Ø§Ù„Ù…Ø­Ø¨Ø©ØŒ Ø¹Ø¯Ø¯8ØŒ 1998. "Ø§Ù„Ù…Ø¬Ù…Ø¹ Ø§Ù„Ø£Ø¨Ø±Ø´ÙŠØŒ ÙŠØ³ÙˆØ¹ Ø§Ù„Ù…Ø³ÙŠØ­ ÙŠÙ†Ø¨ÙˆØ¹ Ø§Ù„Ù†Ø¬Ø¯Ø¯ ÙˆØ§Ù„Ø´Ø±ÙƒØ© ÙÙŠ Ø§Ù„ÙƒÙ†ÙŠØ³Ø©"ØŒ Ø³Ù„Ø³Ù„Ø© Ø­Ø¶Ø§Ø±Ø© Ø§Ù„Ù…Ø­Ø¨Ø©ØŒ Ø¹Ø¯Ø¯9ØŒ Ø­Ø²ÙŠØ±Ø§Ù† 1999. "Ø³Ù†Ø© Ø§Ù„ÙŠÙˆØ¨ÙŠÙ„ Ø§Ù„ÙƒØ¨ÙŠØ± Ø§Ù„Ù…Ù‚Ø¯Ø³Ø© ÙˆØªØ±ØªÙŠØ¨Ø§Øª Ù„Ù†ÙŠÙ„ Ø§Ù„ØºÙØ±Ø§Ù†Ø§Øª"ØŒ Ø³Ù„Ø³Ù„Ø© Ø­Ø¶Ø§Ø±Ø© Ø§Ù„Ù…Ø­Ø¨Ø©ØŒ Ø¹Ø¯Ø¯10ØŒ 2000. "Ø®Ø¯Ù…Ø© Ø§Ù„Ù…Ø­Ø¨Ø© ÙÙŠ Ø§Ù„Ø£ÙˆÙ‚Ø§Ù ÙˆØ§Ù„Ø±Ø¹Ø§ÙŠØ§ ÙˆØ§Ù„Ø£Ø¨Ø±Ø´ÙŠØ©ØŒ ØªÙˆØ¬ÙŠÙ‡Ø§Øª Ø¥Ø¯Ø§Ø±ÙŠØ© ÙˆØ±Ø§Ø¹ÙˆÙŠØ©"ØŒ Ø³Ù„Ø³Ù„Ø© Ø­Ø¶Ø§Ø±Ø© Ø§Ù„Ù…Ø­Ø¨Ø©ØŒ Ø¹Ø¯Ø¯11ØŒ 2006. "Ø§Ù„Ù„Ù‘Ù‡ Ù…Ø­Ø¨Ø©ØŒ Ø±Ø³Ø§Ù„Ø© Ø§Ù„Ø¨Ø§Ø¨Ø§ Ø¨Ù†Ø¯ÙƒØªÙˆØ³ Ø§Ù„Ø³Ø§Ø¯Ø³ Ø¹Ø´Ø±ØŒ Ù…ÙˆØ§Ø¹Ø¸ Ø§Ù„ØµÙˆÙ…"ØŒ Ø³Ù„Ø³Ù„Ø© Ø­Ø¶Ø§Ø±Ø© Ø§Ù„Ù…Ø­Ø¨Ø©ØŒ Ø¹Ø¯Ø¯12ØŒ 1996. "Ø¯Ù„ÙŠÙ„ Ø§Ù„ÙƒØ§Ù‡Ù† ÙˆØ§Ù„Ø±Ø¹ÙŠØ© ÙˆØ§Ù„Ø¹Ù…Ù„ Ø§Ù„Ø±Ø¹ÙˆÙŠ"ØŒ Ø³Ù„Ø³Ù„Ø© Ø­Ø¶Ø§Ø±Ø© Ø§Ù„Ù…Ø­Ø¨Ø©ØŒ Ø¹Ø¯Ø¯13ØŒ 2007. "Ø¯Ù„ÙŠÙ„ Ø§Ù„Ø£Ø³Ù‚Ù ÙˆØ§Ù„Ø¯Ø§Ø¦Ø±Ø© ÙˆØ§Ù„Ù‡ÙŠÙƒÙ„ÙŠØ§Øª"ØŒ Ø³Ù„Ø³Ù„Ø© Ø­Ø¶Ø§Ø±Ø© Ø§Ù„Ù…Ø­Ø¨Ø©ØŒ Ø¹Ø¯Ø¯14ØŒ 2008. Ù…Ø¤Ù„ÙØ§Øª Ù…Ø·Ø¨ÙˆØ¹Ø© - Ø³Ù„Ø³Ù„Ø© Ø§Ù„ØªÙ†Ø´Ø¦Ø© Ø§Ù„Ù…Ø³ÙŠØ­ÙŠØ©ØŒ Ø§Ù„Ø¬Ø²Ø¡ Ø§Ù„Ø£ÙˆÙ„ØŒ 2005-2006 (Ù…Ù†Ø´ÙˆØ±Ø§Øª Ø¬Ø§Ù…Ø¹Ø© Ø³ÙŠØ¯Ø© Ø§Ù„Ù„ÙˆÙŠØ²Ø©). - Ø³Ù„Ø³Ù„Ø© Ø§Ù„ØªÙ†Ø´Ø¦Ø© Ø§Ù„Ù…Ø³ÙŠØ­ÙŠØ©ØŒ Ø§Ù„Ø¬Ø²Ø¡ Ø§Ù„Ø«Ø§Ù†ÙŠØŒ 2006-2007 (Ù…Ù†Ø´ÙˆØ±Ø§Øª Ø¬Ø§Ù…Ø¹Ø© Ø³ÙŠØ¯Ø© Ø§Ù„Ù„ÙˆÙŠØ²Ø©). - Ø³Ù„Ø³Ù„Ø© Ø§Ù„ØªÙ†Ø´Ø¦Ø© Ø§Ù„Ù…Ø³ÙŠØ­ÙŠØ©ØŒ Ø§Ù„Ø¬Ø²Ø¡ Ø§Ù„Ø«Ø§Ù„Ø«ØŒ 2007-2008(Ù…Ù†Ø´ÙˆØ±Ø§Øª Ø¬Ø§Ù…Ø¹Ø© Ø³ÙŠØ¯Ø© Ø§Ù„Ù„ÙˆÙŠØ²Ø©). - Ø³Ù„Ø³Ù„Ø© Ø§Ù„ØªÙ†Ø´Ø¦Ø© Ø§Ù„Ù…Ø³ÙŠØ­ÙŠØ©ØŒ Ø§Ù„Ø¬Ø²Ø¡ Ø§Ù„Ø±Ø§Ø¨Ø¹ØŒ 2008-2009(Ù…Ù†Ø´ÙˆØ±Ø§Øª Ø¬Ø§Ù…Ø¹Ø© Ø³ÙŠØ¯Ø© Ø§Ù„Ù„ÙˆÙŠØ²Ø©). - Ø§Ù„Ø²ÙˆØ§Ø¬ØŒ ØªØ¹Ù„ÙŠÙ… ÙˆØ¥Ø¬ØªÙ‡Ø§Ø¯ Ù‚Ø¶Ø§Ø¦ÙŠØŒ 2007 (Ù…Ù†Ø´ÙˆØ±Ø§Øª Ø¬Ø§Ù…Ø¹Ø© Ø§Ù„Ø­ÙƒÙ…Ø©). Ø£ÙˆØ³Ù…Ø© 1994 : ÙˆØ³Ø§Ù… Ø§Ù„Ø§Ø³ØªØ­Ù‚Ø§Ù‚ Ø§Ù„ÙˆØ·Ù†ÙŠ Ø±ØªØ¨Ø© ÙƒÙˆÙ…Ù†Ø¯ÙˆØ± Ù…Ù† Ø±Ø¦ÙŠØ³ Ø¬Ù…Ù‡ÙˆØ±ÙŠØ© Ø¥ÙŠØ·Ø§Ù„ÙŠØ§. 2007 : ÙˆØ³Ø§Ù… Ø§Ù„Ø£Ø±Ø² Ø§Ù„ÙˆØ·Ù†ÙŠ Ø±ØªØ¨Ø© ÙƒÙˆÙ…Ù†Ø¯ÙˆØ± Ù…Ù† Ø±Ø¦ÙŠØ³ Ø¬Ù…Ù‡ÙˆØ±ÙŠØ© Ù„Ø¨Ù†Ø§Ù†. Ø§Ù„Ø¨Ø·Ø±ÙŠØ±Ùƒ Ø§Ù„Ø¬Ø¯ÙŠØ¯ Ù…Ø§Ø± Ø¨Ø´Ø§Ø±Ø© Ø¨Ø·Ø±Ø³ Ø§Ù„Ø±Ø§Ø¹ÙŠ ÙˆØ§Ù„Ø­Ø¶ÙˆØ± Ø§Ù„Ù‰ ÙƒÙ†ÙŠØ³Ø© Ø³ÙŠØ¯Ø© Ø§Ù„ØµØ±Ø­ ÙˆØ¨Ø¹Ø¯Ù…Ø§ Ø¨Ø§Ø±Ùƒ Ø§Ù„Ø­Ø¶ÙˆØ±ØŒ Ø§Ù„Ù‚Ù‰ ÙƒÙ„Ù…Ø© Ù‚Ø§Ù„ ÙÙŠÙ‡Ø§:"Ø¨Ø¯Ø£Ù†Ø§ Ø§Ù„Ø±ÙŠØ§Ø¶Ø© ÙˆØ§Ù„Ù…Ø¬Ù…Ø¹ Ø§Ù„Ø§Ù†ØªØ®Ø§Ø¨ÙŠ Ø¨Ø¹ÙˆØ§ØµÙ ÙˆÙ‚Ø§Ù„ Ù„Ù†Ø§ Ø§Ù„Ø³ÙÙŠØ± Ø§Ù„Ø¨Ø§Ø¨ÙˆÙŠ Ø§Ù†Ù‡Ø§ Ø¹Ù„Ø§Ù…Ø§Øª Ø§Ù„Ø±ÙˆØ­ØŒ ÙˆØ§ØªÙŠÙ†Ø§ Ù„Ù†Ø´ÙƒØ± Ø§Ù„Ù„Ù‡ ÙÙŠ Ø§Ù„Ø±ÙŠØ§Ø¶Ø© Ø§Ù„ØªÙŠ Ø¯Ø§Ù…Øª ÙŠÙˆÙ…ÙŠÙ† ÙˆØ¹Ù…Ù„ÙŠØ© Ø§Ù†ØªØ®Ø§Ø¨ Ø¨Ø·Ø±ÙŠØ±Ùƒ Ø®Ù„ÙØ§ Ù„Ù„Ø¨Ø±ÙŠØ±Ùƒ Ø§Ù„Ø¯Ø§Ø¦Ù… ÙˆØ§Ù„Ø§Ø¨ Ø§Ù„Ø¯Ø§Ø¦Ù… Ø§Ù„ÙƒØ§Ø±Ø¯ÙŠÙ†Ø§Ù„ Ù…Ø§Ø± Ù†ØµØ±Ø§Ù„Ù„Ù‡ ØµÙÙŠØ±. ÙˆØ§Ø¶Ø§Ù:"Ù‚Ø§Ù„ Ø§Ø®ÙˆØ§Ù†ÙŠ Ø§Ù„Ø³Ø§Ø¯Ø© Ø§Ù„Ù…Ø·Ø§Ø±Ù†Ø© Ø§Ù† Ø§Ù„Ø±ÙˆØ­ Ø§Ù„Ù‚Ø¯Ø³ ÙˆÙ†Ø­Ù† Ø§Ø®ØªØ±Ù†Ø§Ùƒ Ø¨Ø·Ø±ÙŠØ±ÙƒØ§ØŒ Ù†Ø¹Ù… Ù‡Ùˆ Ø±ÙˆØ­ Ø§Ù„Ù‚Ø¯Ø³ ÙˆØ«Ù‚Ø© Ø§Ù„Ù…Ø·Ø§Ø±Ù†Ø© Ø§Ù„ØªÙŠ Ø§Ø³ØªÙ‚Ø±Øª Ø¹Ù„ÙŠØŒ ÙˆØ§Ø±Ø§Ø¯ÙˆÙ†ÙŠ Ù„ÙƒÙŠ Ù†Ø®Ø¯Ù… Ù…Ø¹Ø§ ÙƒÙ†ÙŠØ³ØªÙ†Ø§ ÙˆØ§Ù† ÙØ±Ø­Ù†Ø§ Ù„Ø¹Ø¸ÙŠÙ… ÙˆÙ‡ÙŠ Ù…Ù† Ø§Ø¹Ù…Ø§Ù„ Ø§Ù„Ø±ÙˆØ­ØŒ Ù„Ù… Ù†Ø´Ù‡Ø¯ Ø§Ù†ØªØ®Ø§Ø¨ Ù…Ù† Ù‡Ø°Ø§ Ø§Ù„Ù†ÙˆØ¹ ÙƒÙ„Ù‡Ø§ Ù…Ø­Ø¨Ø© ÙˆØ³Ø±ÙˆØ±ØŒ ØªØ¨Ø§Ø±Ùƒ Ø§Ù„Ù„Ù‡ ". ÙˆØªØ§Ø¨Ø¹:" Ø§Ù„ÙƒÙ†ÙŠØ³Ø© ØªØªÙˆØ§ØµÙ„ Ø¹Ø¨Ø± Ù‚ÙŠØ§Ø¯Ø© Ø±ÙˆØ­ Ø§Ù„Ù‚Ø¯Ø³ ÙˆØ¨Ø¨Ø±ÙƒØ© Ø³ÙŠØ¯Ø© Ø¨ÙƒØ±ÙƒÙŠ ÙˆØ³ÙŠØ¯Ø© Ù„Ø¨Ù†Ø§Ù† ÙˆÙ†Ø­Ù† Ø§Ù„ÙŠÙˆÙ… Ø¨ÙØ±Ø­ Ù„Ø§Ù† Ø§Ù„Ø±ÙˆØ­ Ù…Ø¹Ù†Ø§ ÙˆÙ„ØªØ¨Ù‚Ù‰ Ù…Ø¹Ù†Ø§ØŒ ÙˆØ§ØªÙ…Ù†Ù‰ Ø§Ù† Ø§Ø­Ø§ÙØ¸ Ø¹Ù„Ù‰ Ù…Ø§ ØªØ±ÙƒØªÙ… Ù„Ù†Ø§ ÙŠØ§ ØµØ§Ø­Ø¨ Ø§Ù„ØºØ¨Ø·Ø© Ù…Ù† Ù…Ø«Ù„ ÙÙŠ Ø§Ù„Ø­ÙŠØ§Ø©". ÙˆØ¹Ø¨Ø± Ø¹Ù† Ø´ÙƒØ±Ù‡ Ø§Ù„ÙƒØ¨ÙŠØ± "Ù„Ù„Ù…Ø­Ø¨ Ù…Ø¯Ø¨Ø± Ø§Ù„ÙƒÙ†ÙŠØ³Ø© Ø§Ù„Ù…Ø·Ø±Ø§Ù† Ø§Ø¨Ùˆ Ø¬ÙˆØ¯Ø©ØŒ Ø§Ù‚ÙˆÙ„ Ù‡Ø°Ø§ Ù„Ø§Ù†Ù‡ Ù…Ù† 25 Ø³Ù†Ø© Ø§ÙˆÙØ¯Ù‡ ØµØ§Ø­Ø¨ Ø§Ù„ØºØ¨Ø·Ø© ÙŠØ­Ù…Ù„ Ù„ÙŠ Ø®Ø¨Ø± Ø§Ù†ØªØ®Ø§Ø¨ÙŠ Ø§Ø³Ù‚ÙØ§ Ø¨Ø·Ø±ÙŠØ±ÙƒÙŠØ§ ÙˆØ§Ù„ÙŠÙˆÙ… Ø­Ù…Ù„ Ù„ÙŠ Ø¨Ø´Ø§Ø±Ø© Ø§Ù†ØªØ®Ø§Ø¨ÙŠ Ø¨Ø·Ø±ÙŠØ±ÙƒØ§". ÙˆÙ‚Ø§Ù„:"Ø¹Ø´Ù†Ø§ ÙØ±Ø­Ø§ Ø¹Ø¸ÙŠÙ…Ø§ ÙˆÙ‡Ø°Ù‡ Ø«Ù‚Ø© ÙƒØ¨ÙŠØ±Ø© ÙˆÙ‡Ø°Ø§ Ø¯ÙŠÙ† Ø§Ù† Ù†Ø¹ÙŠØ´ Ù…Ø¹Ø§ ÙˆÙ†Ø­Ø§ÙØ¸ Ø¹Ù„Ù‰ Ø´Ø±ÙƒØ© Ø§Ù„Ø­Ø¨ ÙˆÙ‡Ø°Ù‡ Ø§Ù„Ø´Ø±ÙƒØ© Ù‚Ø¯Ø±Ù†ÙŠ Ø§Ù„Ù„Ù‡ Ø§Ù† Ù†ØªÙ…ÙƒÙ† Ù…Ù† Ø­Ù…Ù„ Ø®Ø¯Ù…ØªÙ†Ø§ Ù…Ø¹Ø§ ÙˆÙ…Ù† ÙˆØ­ÙŠ Ø§Ù„Ø§ÙŠØ§Ù… Ø§Ù„Ø¬Ù…ÙŠÙ„Ø© Ø§Ù„ØªÙŠ Ù‚Ø¶ÙŠÙ†Ø§Ù‡Ø§ Ù…Ø¹Ø§ "Ø´Ø±ÙƒØ© ÙˆÙ…Ø­Ø¨Ø©" Ù‡Ø°Ø§ Ù‡Ùˆ Ø´Ø¹Ø§Ø± Ø®Ø¯Ù…ØªÙŠ Ø§Ù„Ø¨Ø·Ø±ÙŠØ±ÙƒÙŠØ© ØªØ¨Ø¯Ø£ ÙÙŠ Ù…Ø§ Ø¨ÙŠÙ†Ù†Ø§ ÙÙŠ Ù…Ø¬Ù„Ø³Ù†Ø§ Ø§Ù„Ø§Ø³Ù‚ÙÙŠ ÙˆÙÙŠ ÙƒÙ†ÙŠØ³ØªÙ†Ø§ ÙˆÙÙŠ ÙˆØ·Ù†Ù†Ø§". Ø§Ø¶Ø§Ù:" Ø§ÙˆØ¯ Ø§Ù† Ø§Ø¹Ø±Ø¨ Ø¹Ù† Ø´ÙƒØ±ÙŠ Ø§Ù„ÙƒØ¨ÙŠØ± Ù„Ù„Ø³ÙÙŠØ± Ø§Ù…ÙŠÙ† Ø§Ù„Ø®Ø§Ø²Ù† ÙˆØ§Ù„Ù†Ø§Ø¦Ø¨ Ø§Ù„Ø³Ø§Ø¨Ù‚ ÙØ±ÙŠØ¯ Ù‡ÙŠÙƒÙ„ Ø§Ù„Ø®Ø§Ø²Ù† Ø¹Ù„Ù‰ Ø­Ø±Ø§Ø³Ø© Ø§Ù„ÙƒØ±Ø³ÙŠ Ø¨ÙƒÙ„ Ù…Ø­Ø¨Ø© ÙˆØ´ÙØ§ÙÙŠØ© ÙˆØ¹Ù„Ù…Øª Ø§Ù†Ù‡ Ù„Ù… ÙŠØªØ³Ø±Ø¨ Ø´ÙŠØ¡ Ø§Ù„Ù‰ Ø§Ù„Ø®Ø§Ø±Ø¬ Ø¨ÙØ¶Ù„Ù‡Ù…Ø§". ÙˆØªÙˆØ¬Ù‡ Ø¨Ø§Ù„ØªØ­ÙŠØ© "Ù„Ø§Ø¨Ù†Ø§Ø¡ ÙƒÙ†ÙŠØ³ØªÙ†Ø§" ÙˆÙ‚Ø§Ù„:"Ù†Ø±Ø¬Ùˆ Ø§Ù† ÙŠØ­Ø§ÙØ¸ Ø§Ù„Ø¬Ù…ÙŠØ¹ Ø¹Ù„Ù‰ Ù…Ø­Ø¨Ø© Ø§Ù„Ù„Ù‡ ÙˆØ§Ù„ÙƒÙ†ÙŠØ³Ø© ÙˆØ§Ù„ÙˆØ·Ù† Ø§Ù„Ø­Ø¨ÙŠØ¨ Ù„Ø¨Ù†Ø§Ù†". ÙˆØªØ§Ø¨Ø¹:" Ù†ØµÙ„ÙŠ Ù…Ù† Ø§Ø¬Ù„ Ù„Ø¨Ù†Ø§Ù† Ù„ÙƒÙŠ ÙŠØ®Ø±Ø¬ Ù…Ù† Ø§Ø²Ù…ØªÙ‡ ÙˆÙ„ÙƒÙŠ ÙŠØ¯Ø±Ùƒ Ø§Ù† Ù„Ù‡ Ø±Ø³Ø§Ù„Ø© Ø§Ø³Ø§Ø³ÙŠØ© ÙƒÙ…Ø§ Ù‚Ø§Ù„Ù‡Ø§ Ø§Ù„Ø¨Ø§Ø¨Ø§ ÙŠÙˆØ­Ù†Ø§ Ø¨ÙˆÙ„Ø³ Ø§Ù„Ø«Ø§Ù†ÙŠ ÙÙŠ Ø²Ù…Ù† ÙŠØ¹ÙŠØ´ Ø§Ù„Ø´Ø±Ù‚ Ø§ÙŠØ§Ù…Ø§ ØµØ¹Ø¨Ø©". ÙˆØ®ØªÙ…:"Ù†Ø´ÙƒØ± Ø§Ù„Ø±Ø¨ Ø¹Ù„Ù‰ ÙƒÙ„ Ø´ÙŠØ¡ ÙˆØ§ÙˆØ¯ Ø§Ù† Ù†ØµÙ„ÙŠ Ù…Ø¹Ø§ Ù‚Ø¨Ù„ Ø§Ù† Ø§Ø®ØªÙ…ØŒ Ø§Ø±Ø§Ø¯ Ø§Ù„Ù…Ø¬Ù…Ø¹ Ø§Ù„Ù…Ù‚Ø¯Ø³ Ø§Ù† ÙŠÙ†ØªØ®Ø¨ Ø±Ø§Ù‡Ø¨Ø§ Ø¨Ø·Ø±ÙŠØ±ÙƒØ§ ÙˆØ§Ø±Ø§Ø¯ÙˆØ§ Ù„Ø°Ù„Ùƒ Ø¯Ù„Ø§Ù„Ø© Ø¹Ù„Ù‰ Ø§Ù† Ø§Ù„Ø±Ù‡Ø¨Ø§Ù†ÙŠØ© Ù‚Ù„Ø¨ Ø§Ù„ÙƒÙ†ÙŠØ³Ø© ÙˆÙ†ØªØ·Ù„Ø¹ Ø§Ù„Ù‰ Ù…Ø²ÙŠØ¯ Ù…Ù† Ø§Ù„Ù…Ø¤Ø§Ø²Ø±Ø© ÙˆØ§Ù„ØªØ¹Ø§ÙˆÙ† ÙˆØ§Ù„Ø¹Ù…Ù„ Ù…Ø¹Ø§ Ù„Ù†Ø­Ù…Ù„ Ø±Ø³Ø§Ù„ØªÙ†Ø§ ÙÙŠ Ù„Ø¨Ù†Ø§Ù† ÙˆØ§Ù„Ø´Ø±Ù‚ ÙˆÙÙŠ Ø¹Ø§Ù„Ù… Ø§Ù„Ø§Ù†ØªØ´Ø§Ø±".